Quite the words to live a life by. At young ages, sisters Amy and Kim Townsend (Amy Schumer, Brie Larson) have it beat in their heads by their cheating father (Colin Quinn), that people weren’t meant to stay with one person. As the women have grown into adulthood, sister Kim finds happiness in a traditional, monogamous lifestyle. Sister Amy has heeded the advice of her kooky father. Magazine writer Amy has all of the fun—mostly sexual—that is afforded to a successful career woman living in New York City–without the commitment of being tied down. Things seem to work for her, but to most around her, she is in a neverending cycle that may be called a Trainwreck. On assignment to write a story on world-renowned sports doctor Aaron Connors (Bill Hader), Amy tries to abide by the initial cycle of hanging out, sexing, and never seeing male friend again. But with Aaron, feelings exist that had never previously before. Could it really be the L word? How much can the script honestly be flipped in a romantic comedy? Not a lot. But, with Trainwreck, the simple flip of making the woman the one afraid of commitment instead of a man does, in some ways, make for a relatively fresh romantic-comedy. A groundbreaking one it isn’t, but a solid quality one that delivers pretty consistently in the laugh department. 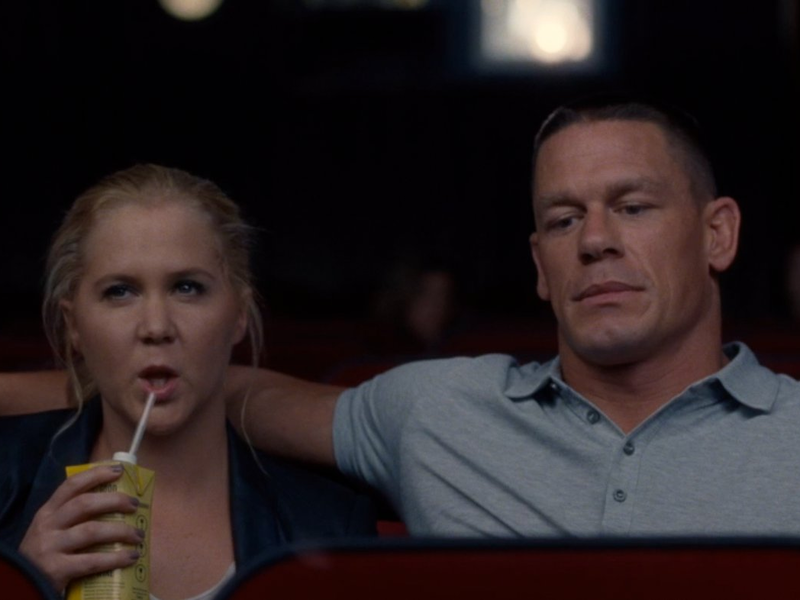 If Trainwreck is to be remembered for one thing only, the official arrival of Amy Schumer would likely be it. Even with Judd Apatow directing (editing feels a little off with this one), he feels more along for the ride as opposed to putting his imprint on this. This serves as her first real film appearance in a feature, save for a bit part in Seeking a Friend for the End of the World, and all in all, it is a great and successful effort. Yours truly hasn’t seen a ton Schumer’s work on Comedy Central, but from what has been seen, the stuff has been not bad, and she brings the same unfiltered and blue comedy found on the show. However, she gets the chance to show some versatility as well with non-comedic moments, which could be a precursor for things to come down the line. In only one leading film, she should be set for life with these roles if she wants them. Acting only is one part of her contribution here, with the other being writing. It’s quite the credit to be the sole writer on anything, regardless of experience, and she once again does a sound job in keeping the story running along and creating entertaining characters. But, it may not be as strong as her performance. The over two-hour length begins to be felt, as one would expect, near the end. Some bits run on a tad too long for my liking; not that the the last 30 or so minutes are lacking funny parts, just that two or three scenes could have been trimmed in length, and still been as funny. And as alluded to before, Trainwreck is more routine than anticipated, but again, how much can really be changed when working within the confines of the rom-com genre? Sort of like Melissa McCarthy’s Spy (though one may have to be more of a Schumer fan to enjoy this in contrast to a non-McCarthy fan enjoying Spy), Trainwreck gives ample opportunity for the lead’s supporting cast to shine. Just about all are game for it. Bill Hader is not completely a straight man, but he is, aside from Brie Larson, the most sensible person throughout while being funny when asked to be. As the father who puts Amy down her life path, Colin Quinn starts the movie on a riot, and though his emotional part of the story fell sort of flat for yours truly, it was a cool thing to see his relationship, or lack thereof, with his daughters. Even Tilda Swinton, once again sort of unrecognizable, has no issues assigning the worst possible stories for her magazine writers. The only characters who could be done without are played by Ezra Miller (weird intern), and Vanessa Bayer (placemat that everyone walks over). The real scene stealers for my money are easily John Cena, and LeBron James. The former is only in for a maximum of probably 10 minutes and plays the character in a fitness nut/bodybuilder expected, but man, the champ is certainly here as a comedic force. Ohio’s own is nothing more than a fictional version of himself (why is he spending so much time in New York though? ), but he is impressive and has many awesome moments of deadpan humor. Most importantly, he is natural and enaging, which many athletes fail at when on camera in movies or TV. Hader and LeBron share just as much chemistry, if not more, than Hader and Schumer, and their friendship is sweet and hilarious. With just the simple role reversal of wild woman being incapable of commitment instead of the man, Trainwreck is a fun look at an age-old rom-com convention, despite it not being that different with how things play out. As raunchy comedies go, it is one of the better ones of late, and if any doubts were had about Schumer being capable of being a comedy lead, they should be put to rest. Photo credits go to nerdist.com, screenslam.com, and businessinsider.com. All in all, I was laughing pretty consistently, and hard for that matter. Best comedy I’ve seen this year so far. I’ve actually liked 3 comedies this year which is rare not only that there has been 3, but that I’ve liked them..hahahah Kingsmen, Spy & Trainwreck.. all fantastic for me. I guess I consider Kingsman more of an action though it is funny in places lol. Thought Spy was fine, but this had me laughing throughout. Yeah Kingsman more action than comedy..and darker comedy at that. This was just flat out fun! Actually forgot I watched A Deadly Adoption and loved it haha! 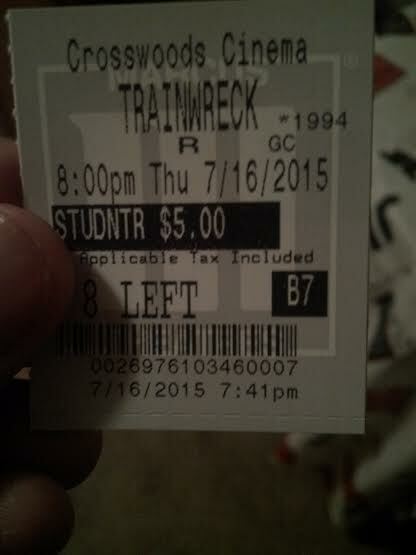 That is my favorite comedy of the year, but from wide releases, Trainwreck takes the cake so far. Idk I actually thought Ezra Miller’s role was pretty darn hilarious. He was definitely an oddball, but I’ve really enjoyed watching that guy grow as a supporting player. My introduction to him was in The Perks of Being a Wallflower. I really liked this movie, it had so smany tropes but the characters were all surprisingly strong and engaged on a level I wasn’t expecting. That goes especially for the athletes involved.